SOLIDWORKS® PDM can now read and write values from or to a SOLIDWORKS revision table. 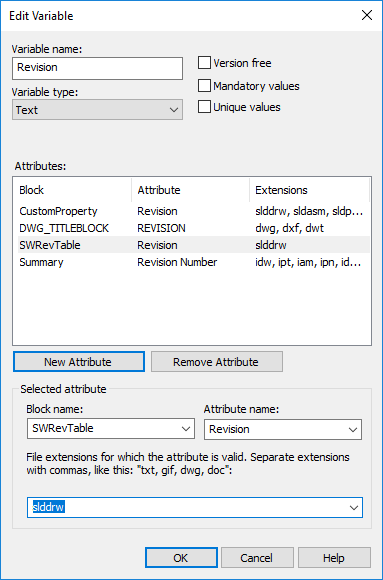 Revision table rows can be updated using set variable transition actions or the set revision command. This ability was in the now discontinued SOLIDWORKS WORKGROUP PDM, has just been added for 2018 to both PDM Professional and Standard. Here is how you can configure your PDM Standard or Professional vault to accomplish this. For this example, we will update the ‘Description’ and ‘Revision’ variables in the table rows. 2. Click the new attribute button. 3. A new attribute is added to the variable. 4. Rename the new block name to ‘SWRevTable’. This must be typed in. It will not be available in drop list until after you enter it manually for the first time. 5. 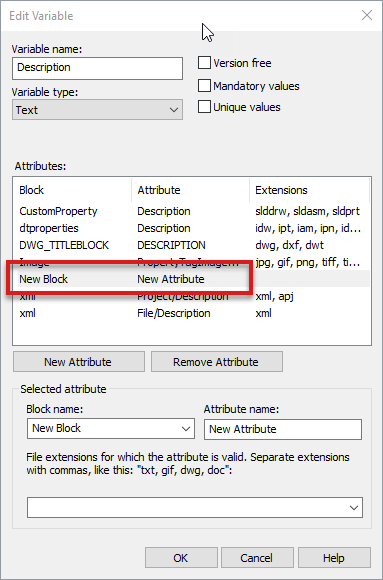 The attribute name should be selected from the droplist for the ‘Description’ variable. 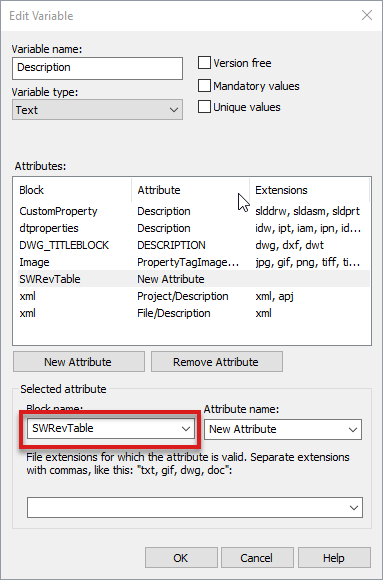 Typing it in manually is possible, but may result in failing to add rows to the table. See published solution S-073768. 6. Enter slddrw for the extension. 9. Repeat same process for the ‘Revision’ variable. SWRevTable should be available in the drop list at this point so it can be selected instead of typed in manually. 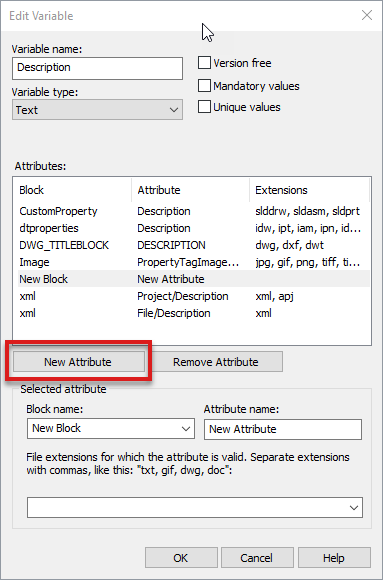 Remember to select the attribute name from the drop list and to not type it in manually. 11. Check the ‘Enable Revision Table’ checkbox. In the Revision Table Settings tab, define how many rows you want to be maintained in the revision table and a placeholder character. 12. 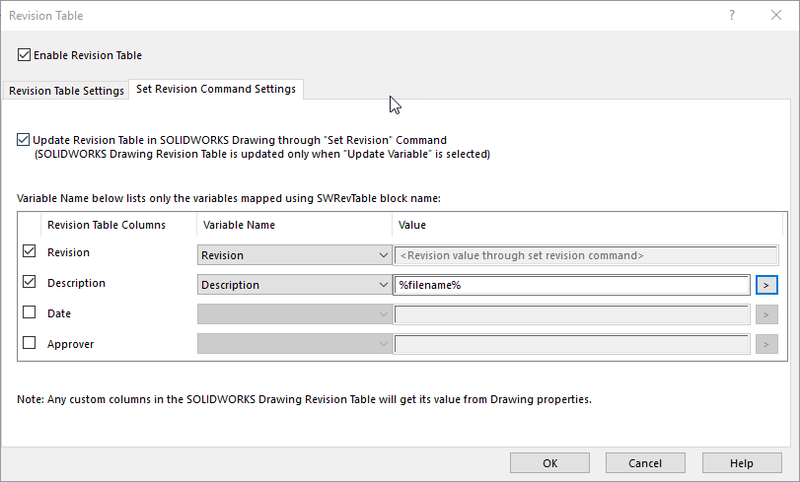 In the ‘Set Revision Command Settings’ tab, check the ‘update revision table in SOLIDWORKS drawing through ‘set revision’ command. Check the ‘Revision’ and ‘Description’ under ‘Revision Table Columns’, select the proper variable from the droplist. This droplist is populated with the variables that have been updated with the ‘SWRevTable’ property mapping. Revision needs no value set but enter a value for ‘Description’. 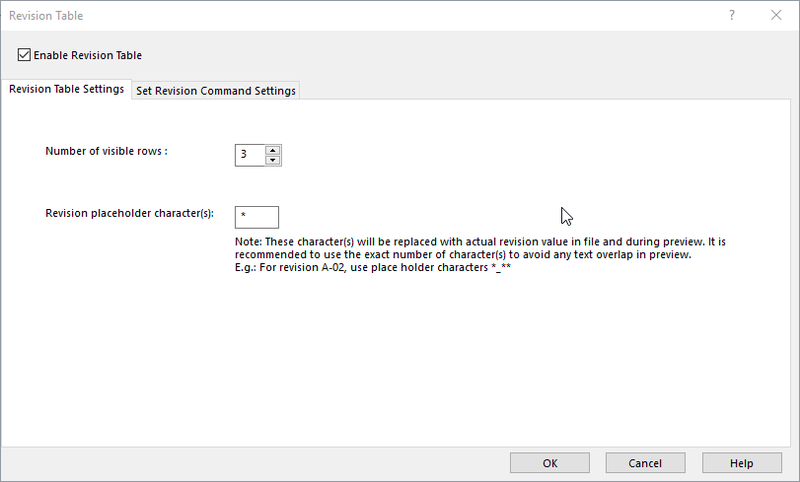 This can be entered manually or selected from the variable list ‘>’ or a combination of both. 13. 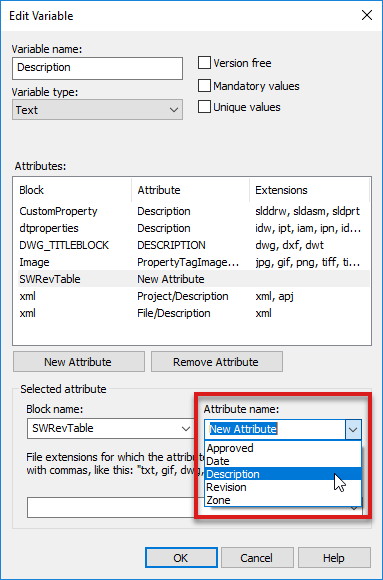 When working with drawing files and using the ‘Set Revision’ command in PDM, be sure to check the ‘update variable’ check box. There will be no update to the revision table if this is not checked. Upon completion of the eLearning, you can take the CSWA-AM exam. The exam validates the knowledge you acquired and is sanctioned with a certification provided by the SOLIDWORKS Certification Program. The eLearning is free with a MySolidWorks account and doesn’t require the use of SOLIDWORKS. SOLIDWORKS users on subscription can get the exam for free. The exam is also free for educators participating in the SOLIDWORKS Academic Certification Provider Program. In the SOLIDWORKS® Resource Monitor or SOLIDWORKS, why do I see the warnings: ‘Available system memory is low’, ‘Available system memory is critically low’, and ‘WARNING! Your system is running critically low on memory’? SOLIDWORKS® monitors your entire computer system resource usage in real time while SOLIDWORKS is running. One of the resources that SOLIDWORKS monitors is the ‘Commit Charge’ counter.Commit Charge is the amount of memory that the Windows® operating system (OS) has committed or promised SOLIDWORKS and any other process running on the computer. For more information, see Solution Id: S-074228. How do I invite a user to my company’s Admin Portal so that I can give them ownership of an online license? To add a new user to the Admin Portal for your company, follow the steps in Solution Id: S-074431. 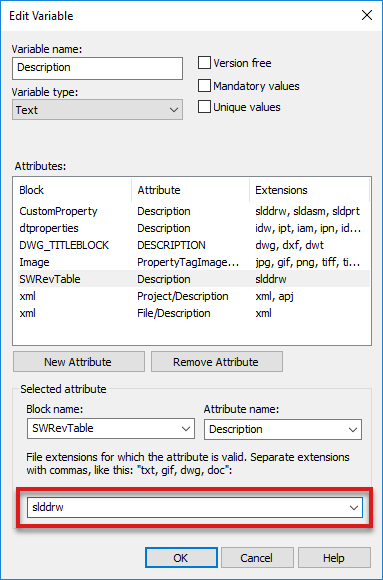 Why does previewing a PDF file in SOLIDWORKS® PDM open the file in the Adobe® Professional software? 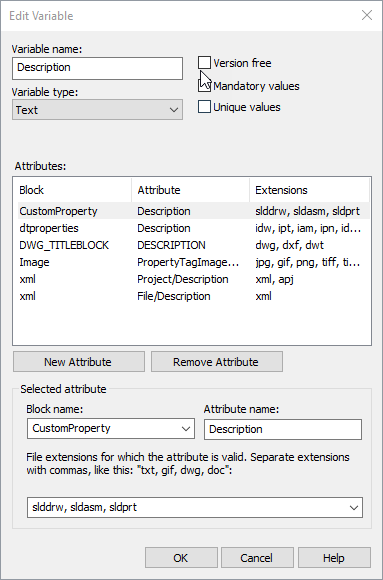 Adobe® Professional does not provide the Active X controls necessary to preview PDF files in SOLIDWORKS® PDM. This behavior occurs if Adobe Professional is installed, but Adobe Reader is not installed. At the same time, the preview window in SOLIDWORKS PDM will display the error ‘Navigation to the webpage was cancelled’. To resolve this issue, follow the steps in Solution Id: S-074207. Why do I receive either the error ‘No restraints are defined. You may use Soft Spring or Inertia Relief options’ or ‘No restraints are defined. Define restraints or use Inertia Relief to stabilize the model’.? In SOLIDWORKS® Flow Simulation, what is the ‘Improved geometry handling’ option? Effective with the release of SOLIDWORKS® Flow Simulation 2018, there is a new ‘Improved geometry handling’ option. When you activate this option, the software uses advanced functions to make Boolean operations to the geometry. In other words, This option activates the use of SOLIDWORKS Flow Simulation’s own Boolean operation functions rather than the use of that of SOLIDWORKS. For more information, see Solution Id: S-074304.